The last of the front-page stories marking major milestones in HHCRS’ history, this article contains a summary of Bernhardt’s address, an edited version of Lasdusky’s address (which survives in the archive) without all the nastiness directed at Bernhardt, and the address of Bernard Glück. An astonishing feature is the inclusion of the Shecheiyanu prayer, written in transliterated Hebrew but not translated! The complete program for the day was printed in local Jewish newspaper. 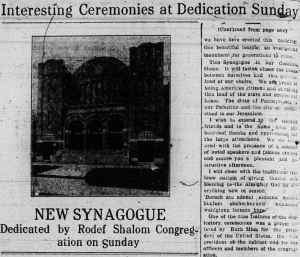 After the dedication, the paper referred to the new synagogue in its article on the upcoming holiday of Rosh Hashana, when “services will be held in the new synagogue on Tenth avenue both days” (9/19/1914). Never in Homestead have been witnessed more interesting and impressive ceremonies than those which attended the dedication of the new synagogue of the congregation Rodef Shalom on Tenth avenue Sunday afternoon. The throng present filled the capacious auditorium and gallery of the handsome structure and among them were many gentiles, who were deeply interested in the ceremony, some of whom had never before attended a religious service with heads unbeared (sic). The features of the dedication proper were the opening of the synagogue doors by Master Gerson Elliott Friedlander; lighting the perpetual light by Miss Ferderber; lighting the Menorah, by Mrs. B. Brown; circuit of the synagogue with the scroll of the law, by Dr. M.H. Moss, assisted by honorary bearers, B. Glueck, Joseph Kartz and I. Feinberg, placing the scroll of the law in the ark and hanging the “Poroiches,” by Mrs. E. Klein. Bernard Glueck acted as master of ceremonies and introduced the speakers. The dedicatory address in Hebrew was delivered by Rabbi A.M. Ashinsky, of Pittsburg. The following are a few of the many pertinent things said in his lengthy address. Just as you cannot have a home without a family so you cannot have Judaism without a synagogue. A ripple of laughter was hear (sic) among those who understood the Hebrew language in one portion of his speech. It was while in the description of the beauty and elaborateness of the building he said it was up-to-date in every respect even having a up-to-date mortgage. He added, none but the deaf, the idiot and the child were exempt from upholding the church. It is no charity but self-sustenance and he made an appeal to the congregation to lift the mortgage as speedily as possible. Rev. Dr. Leonard Levy of the congregation Rodef Shalom, Pittsburg, delivered the dedicatory address in English. He was introduced by the chairman, Mr. Glueck, as a man of international reputation and he has been heard several times in Homestead before. He delivered a strong address and explained what a Jewish synagogue meant. First it means a house of assemblage, second a house of prayer and third a house of learning. He paid a glowing tribute to the American nation and the blessing of the government where all are living in peace while the nations of Europe are at war. Other brief remarks were made by Judge Josiah Cohen, Hon A.C. Stein and Max Weiss and W.F. Stevens, superintendent Carnegie Library. Bernhard Hepps, chairman of the building committee, was called upon for a speech and stated that he thanked the congregation for the confidence displayed by the fact that every cent for the purpose of building had passed through his hands and there had never been a question asked as to what was done with it. He also thanked the members of the building committee for their co-operation without which he could have done little. He announced that the cost of the synagogue was $31,000. “We who are assembled here tonight are here to honor those who have so bravely and nobly worked for the great cause which, seemingly, we have accomplished. We also are here to confer the honorary emblem upon those who deserve to be recognized, and encourage them to work in the future as they have done in the past. We have one man in our congregation, who by his devotion, faithfulness and love for his religion and fellowmen deserves all the honor we can confer upon him. I am unable to find words strong enough to express my thoughts and feeling for this man, who for the last twenty years has worked with might, year in and year out, day and night, always in the front line of battle; not for the purpose of destruction but for upbuilding. This man, who has sacrificed his wealth and health for the great cause which Judaism represents, through his efforts more than to any one other man is due the fact that we are enabled to celebrate this day, as we are celebrating it now. This man is the one who is today at the head of the congregation, our president, Mr. Joseph Lasdusky. I consider it a great honor in having the privilege of addressing this intelligent audience at the dedication of our new Temple. As master of ceremonies, I shall confine my remarks to the subject and give a brief history of the life and of the work accomplished by the Jewish population of Homestead. None of our cradles were rocked in this glorious country. We came here from all four corners of the globe speaking various languages and having different customs. We have united here, living together as one large family, in peace and harmony, and have organized this congregated named Rodef Sholom, meaning Seeking Peace. Under the leadership of worthy President, Mr. Lasdusky, vice-president, Mr. Grinberg, chairman of Building committee, Mr. Hepps and Secretary Dr. M.H. Moss and with the assistance of combined effort of every member of the congregation sparing neither labor nor money, with no financial aid from outside sources we have here erected this building, this beautiful temple, an everlasting monument for generations to come. I wish to extend to the visiting friends and to the home folk my heartiest thanks and appreciation for the large audience. We are honored with the presence of a number of noted speakers and famous orators and assure you a pleasant and constructive (?) afternoon. I will close with the traditional Hebrew custom of giving thanks and blessing to the Almighty God for everything new in season.